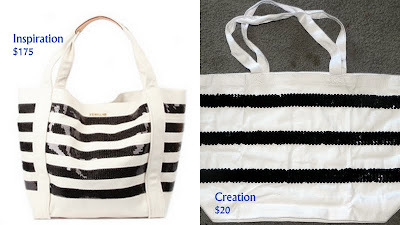 I got a large canvas tote at Joann's for $4 and 3 yards of 1.5 inch wide stretch sequin trim, at $5 a yard. 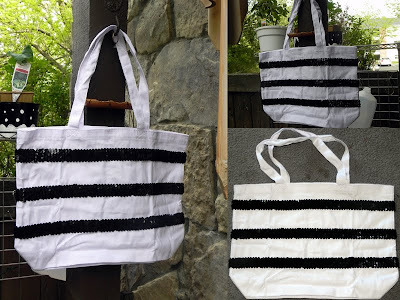 I had Liquid Stitch on hand, and the only other thing I needed was tape and scissors. Before you cut the trim, wrap tape around the area to be cut first. This helps hold everything in place. I've never sewn sequins before, by hand or machine, and I did not want to ruin the trim so I decided to use Liquid Stitch instead, and it's worked perfectly! And here's the finished product! I had only let it dry for a couple hours and didn't want to ruin it, so I didn't really open it up and put stuff in it to style it more like the M Z Wallace one. But, for a fraction of the cost, I think my creation is pretty spot on! Nice work! 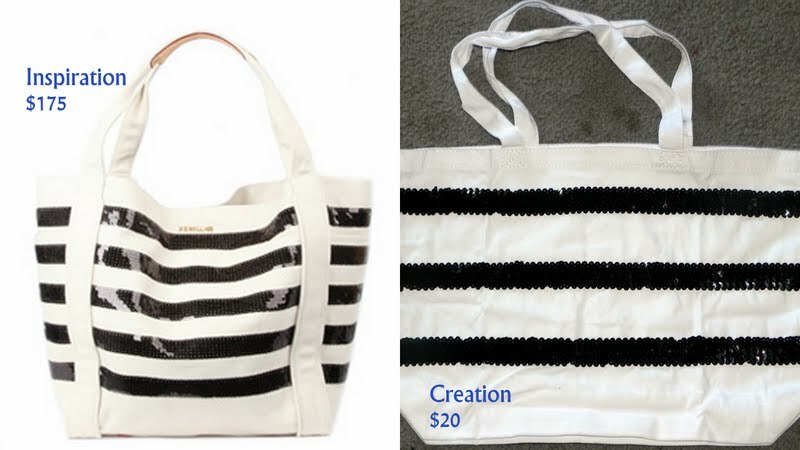 Can't believe how easy it is to create something basically the same as a bag that sells for $175! Ridiculous! great work, it's really nice and so in fashion stripes are everywhere!